I dropped him a note wondering if he'd tried any social network analysis methods to simplify it, or otherwise break it down -- so he sent me the data and said "have a go!" If I had crawled twitter links myself, I might not have used his criteria or seed set, but I was curious if I could make any more sense of his data set as is. 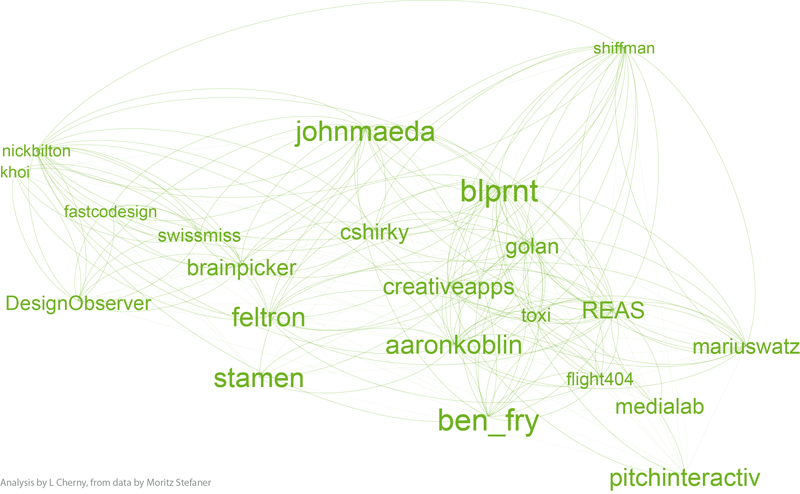 (So I've neither re-crawled, nor added any info such as frequency or content of tweets to this data set). 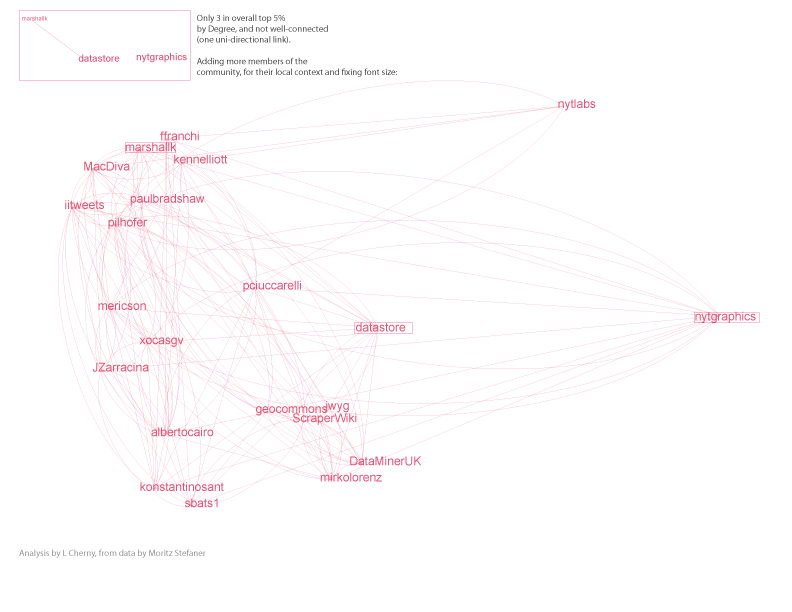 1644 twitter id's are represented, and there are 145,382 edges, or links, between id's. Gephi reports the average path length is 2.5. Gephi and NetworkX say this is a connected graph; Gephi reports 1 weakly and 5 strongly connected components. The average degree is 89.9, but the median is 51. There is a long tail here, meaning that some nodes have very high degree (see below) but most do not. 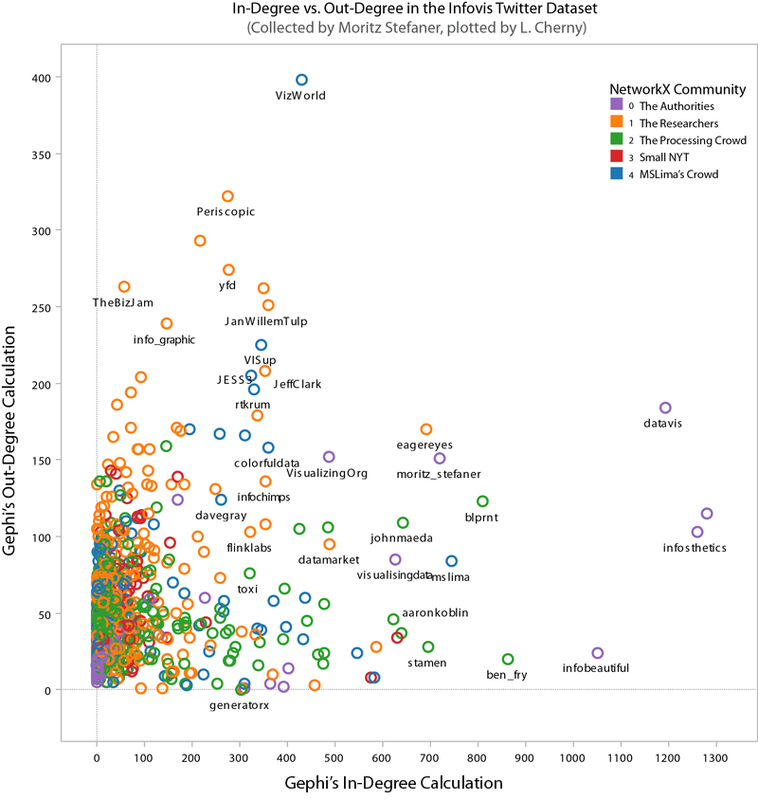 So, interpreting this: In one run, Gephi split up the folks who are in NetworkX's community 0 into Gephi's communities A, B, C, D. Gephi's community C mostly overlaps NetworkX's community 1. The largest names are purple, community 0, or "The Authorities" (a proxy for degree in this case). 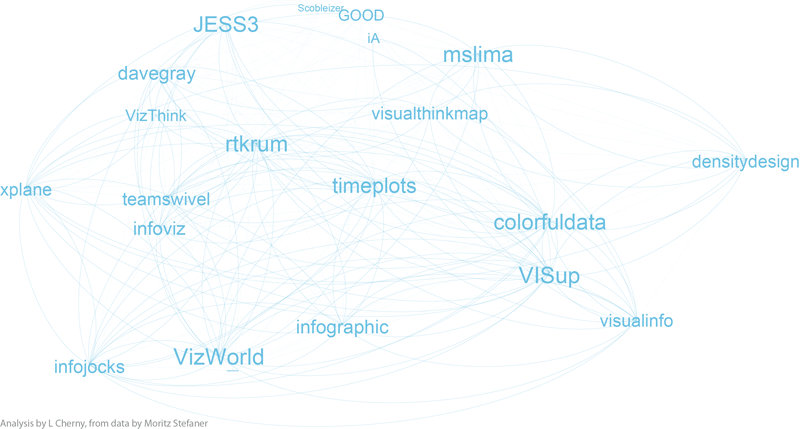 However, when we look at betweenness-centrality, VizWorld scores quite high. 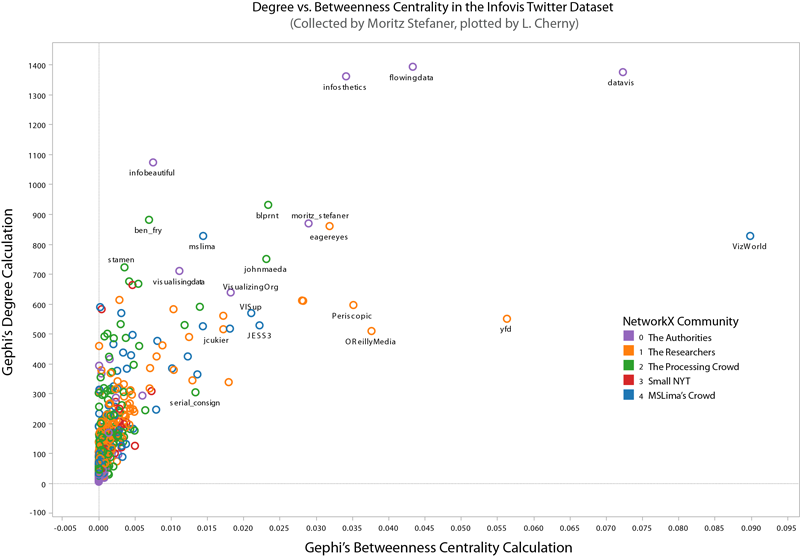 Betweenness-centrality (or centrality) roughly measures connectedness to components of the larger graph. If you'd like to inspect the internal linkage structure corresponding to each community subgroup, click on the small images below to view. I've filtered out all but the top 5% by degree, to highlight the authorities in each sub-group. (Note that this was insufficient for community 3 -- so I expanded it a bit more.) The curved edges indicate "mutual" follow relations, while the straight edges indicate uni-directional, or one-way follow relations. Depending on what you know about the players in these graphs, you will probably see things I don't see. I myself have very little familiarity with the names in communities 3 and 4, while I admit to being surprised or entertained by the links and organization in the other 3 graphs. For example, in community 0, the placement of Visually, and its straight line uni-directional links, is especially interesting to me. 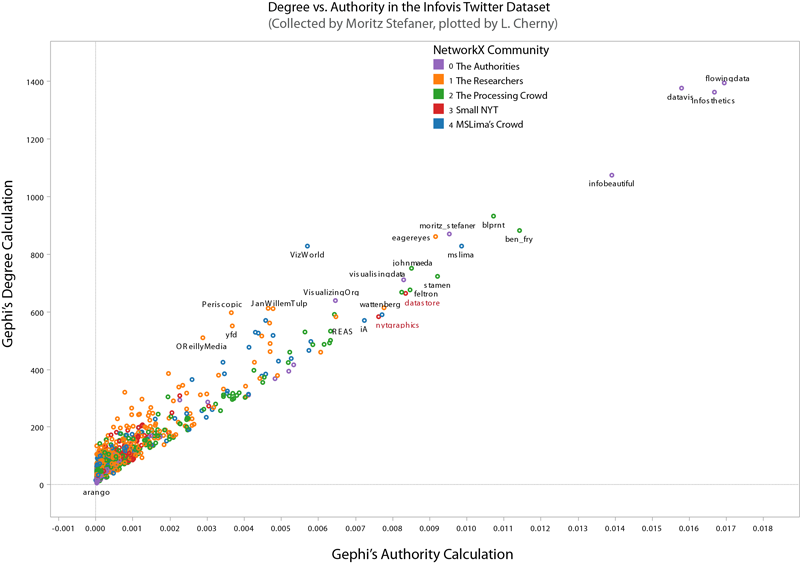 (Remember this graph represents the top 5% by degree-- so Visually at this time scored high on degree, and was classified as a member of the "Authorities" group 0 by the community algorithms, but was not itself closely followed by the others in this elite group.) Green community 2 is also interesting; certainly the artistic folks are there, including the founders, authors, and teachers of Processing courses (ben_fry, REAS, shiffman, blprnt, toxi, mariuswatz, ...); but this group also includes Brainpicker and well-known design firms like Stamen and PitchInteractiv. Wrapping up, these are the tools I used for the analysis, charts, and graphs: Excel, Tableau (for scatterplots), Python, R (correlation plots which weren't shown here), Gephi, Google Docs, Illustrator and Photoshop. It took more time than I expected, in part because of Gephi's alpha status, and having to adjust a lot of the plots by hand in Illustrator! 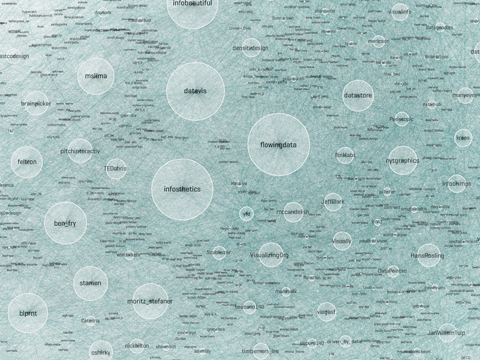 Hopefully the need for hand-tweaking will disappear as Gephi becomes more mature. Postscript: While I was working on this, MS Lima's new book, Visual Complexity, shipped from Amazon. 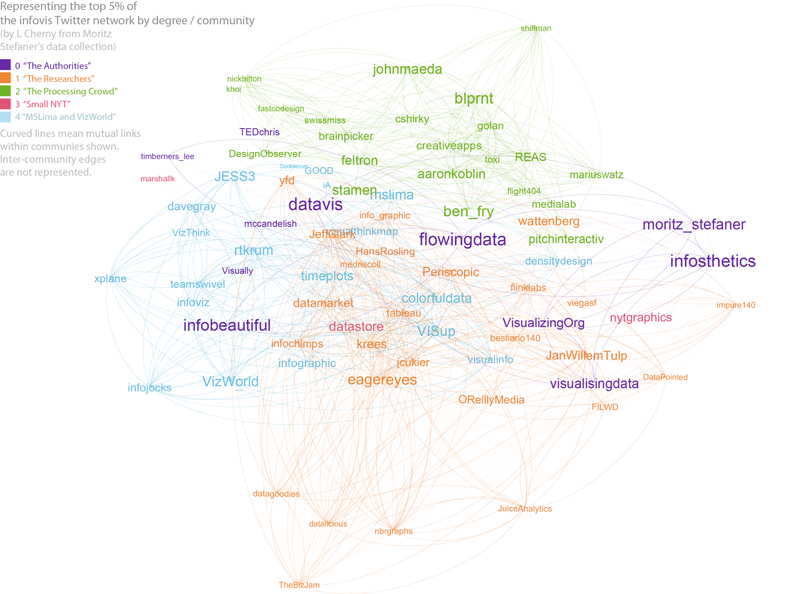 It's a beautiful collection of network visualizations. It seems you did an amazing and interesting job. -It is normal that two implementations of the Louvain method produce two different results. The algorithm is not deterministic because it relies on an order of the nodes and there is no cannonical order. 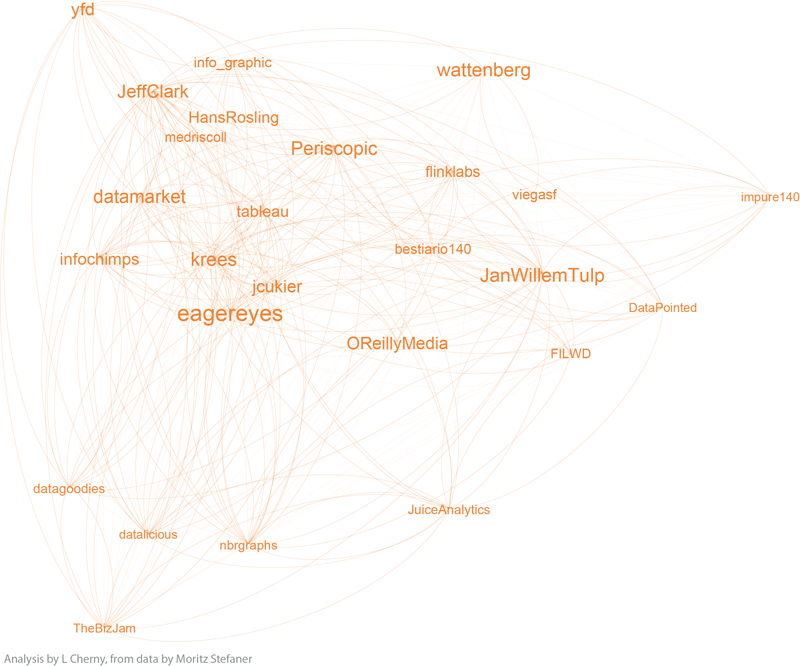 -The Louvain implementation in Gephi 0.7 was bugged, it should be fixed in Gephi 0.8. 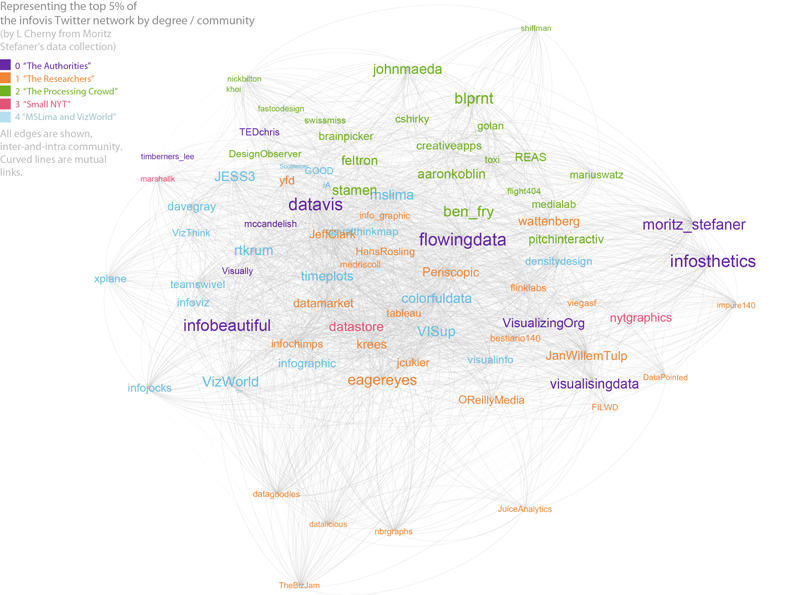 Several metrics in Gephi are bugged and there is a lot of work being done to correct this. Thank you, AM. Yes, it looked like both were using the Louvain method, and I did not look closely at the implementation. Also, yes, the Gephi dialog made it clear it was non-deterministic. I may try an automated series of runs in NetworkX to see how widely the node assignment differs for each node. Thanks for the information on the bugs!